John Whitelegg is the author, co-author, editor or co-editor of the following books. These are available on the internet. NOTE: We do not have copies of these books. Some are available from various web retailers. Hillman, M., Adams, J. and Whitelegg, J. (1990) One False Move: A Study of Children's Independent Mobility Policy Studies Institute, London. Whitelegg, J. (1993) Transport for a Sustainable Future: the case for Europe Belhaven, London. Whitelegg, J. (1997) Critical Mass: Transport Environment and Society in the Twenty-first Century Pluto Press, London. Nick Williams, Maf Smith and John Whitelegg (1998) Greening the Built Environment Earthscan, London. 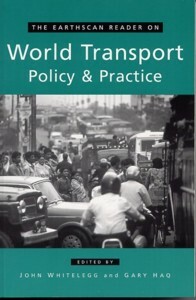 Whitelegg, J. and Haq, G. (eds) (2003) The Earthscan Reader in World Transport Policy and Practice Earthscan, London.